Getting a good IT job for freshers in this tough job market is really a big deal today. Let’s see how Vishal managed to kick-start his career in the IT industry straight out of college. Vishal: My name is Vishal. I’m a fun loving person and always keen to learn new things. You can call me a person who is born to make an impact. Vishal: Most of the big companies need references and I hardly had any. This was the main difficulty that I faced. 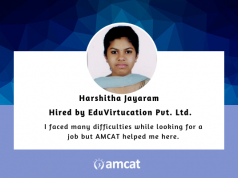 Aspiring Minds: Tell us about your experience post giving the AMCAT test and how AMCAT helped you in getting the job at Afforda Technology Pvt Ltd? 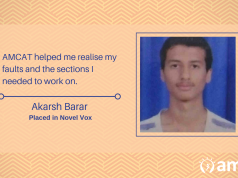 Vishal: AMCAT test helps freshers a lot in getting their first job. It gives them an opportunity to face interviews with good companies and most of the companies consider. AMCAT test as a first round of selection process. Aspiring Minds: How many interview calls did you get after taking the AMCAT? Vishal: I got around 10-15 interview calls. 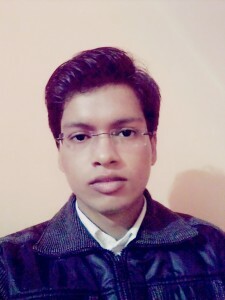 Vishal: Yes, I’ll suggest everyone to take AMCAT, it will give them several opportunities according to their eligibility and performance in AMCAT. It is a wonderful platform for experienced as well as freshers. Vishal: It can take some time to get that dream job of yours. All you have to do is stay motivated and strong. All the best! 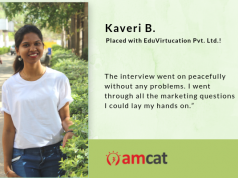 To get that dream IT job of yours take the AMCAT test today!